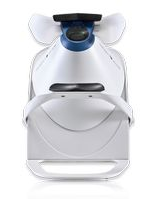 The Optomap offers our eye doctor an unparalleled view of the retina. In less than a few seconds the Optomap takes a ultra wide high definition image which is a permanent part of your file at our practice. In a normal eye exam the patient must go through dilation in order to offer a portion of what is visible with the Optomap. This quick and painless exam offers you the highest level of eye care with the least amount of hassle. The permanent digital image can be used to compare changes which aid in the early detection of eye diseases such as Diabetic Retinopathy, Macular Degeneration, and Retinal Detachment. Because we so firmly believe in the value this offers our patients, we are offering an introductory price of $39. The Oculus is used for re-examination or situations of abnormal findings from a prior exam. It is used as a visual field screener. 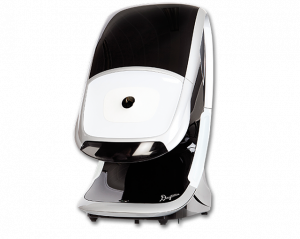 The machine is compact, sleek and easy to use and has an adjusting comfortable chin rest and eye shields for the patient. The Oculus Easyfield was specifically created to assist with glaucoma care, through preventive screening or complete visual field tests and progression analysis. However, the versatility of the device allows for all common tests of the central visual field, independent of the clinical picture. “The Tomy”- known by its full name as The Topographic Modeling System TMS-4 is a useful instrument that provides corneal configuration and refractive characteristics. This device is different than other keratometers instruments as this one employs color maps incorporating the most modern computer technology, to permit easier and more accurate diagnosis than conventional devices. Its key feature is the auto shot system that facilitates operation. Lincoln Park Eyes practice has the latest model and technology for medical devises to assist in their eye care practice; an Autorefractor made by Topcon and a Cornea Topographer. The innovative design of the Topcon KR-8000 enables precise, reliable refraction and keratometric measurements within pupil dilation as narrow as 2.0 mm. This means easier and more exact diagnostic results when dealing with glaucoma, asymmetric pupils, or elderly patients and the Topcon KR-8000 measurement image provides extremely reliable data. Lincoln Park Eyes has also invested in the latest Corneal Topography machine as the machine is used to map the curved surface of the Cornea. This can help measure the quality of vision as well as assist in LASIK surgery and the fitting of contact lenses. This procedure is non-invasive and painless to the patient. a corneal topographer to your practice will help you provide patients with comprehensive eye care. Using a Corneal Topography instrument will also expand your knowledge and fitting skills with specialty lens designs and help you efficiently fit or design the appropriate lenses for each patient. Our Lincoln Park optometrist uses cutting-edge digital imaging technology to assess your eyes. Many eye diseases, if detected at an early stage, can be treated successfully without total loss of vision. Your retinal Images will be stored electronically. This gives our eye doctor a permanent record of the condition and state of your retina. This is very important in assisting your optometrist in Lincoln Park or Lakeview to detect and measure any changes to your retina each time you get your eyes examined, as many eye conditions, such as glaucoma, diabetic retinopathy and macular degeneration are diagnosed by detecting changes over time. Digital Retinal Imaging allows your Lincoln Park eye doctor to evaluate the health of the back of your eye, the retina. It is critical to confirm the health of the retina, optic nerve and other retinal structures. The digital camera snaps a high-resolution digital picture of your retina. This picture clearly shows the health of your eyes and is used as a baseline to track any changes in your eyes in future eye examinations. The DRS is a non-mydriatic fundus camera. A fully automated device, the DRS captures digital images of the central retina without pharmacological pupil dilation. Eye care providers use these images for screening of diabetic retinopathy. An OCT scan is a noninvasive, painless test. It is performed in about 10 minutes right in our office. Feel free to contact Lincoln PArk Eyes to inquire about an OCT at your next appointment. Each eye is tested separately and the entire test takes 15-45 minutes. Our optometrists in Lincoln Park, Chicago may ask only for a driving licence visual field test, which takes 5-10 minutes. If you have just asked for a driving test or the clinic doctor advised you have one, you will be informed of the result by the clinic doctor, in writing, in a few weeks. Normally the test is carried out by a computerised machine, called a Humphrey. Occasionally the manual test has to be used, a Goldman. For each test you have to look at a central point then press a buzzer each time you see the light. This test can also be helpdful in the event of an eye emergency to test if side vision has been damaged.